Call us, or fill out the form for more information! For kids, oral health doesn’t just happen at the dentist’s office. It happens in between visits at home. At Treasured Teeth, we make dental hygiene fun for each and every one of our patients. Our warm and fun atmosphere and gentle hands take the fear out of going to the dentist, and make it a place that your child can enjoy. In between visits with us, we recommend the following tips in keeping your child’s teeth healthy, and teaching healthy habits that will last a lifetime. 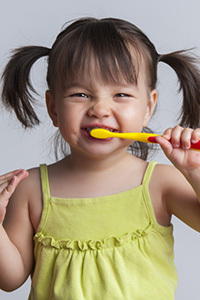 As soon as your children’s first teeth begin to appear, teach them how to brush. For children under three, use a rice-sized amount of toothpaste. Once they grasp the concept of spitting, rather than swallowing the toothpaste, they can begin using a pea-sized amount. When their teeth have grown in enough to be touching, they can brush, floss, and use mouthwash daily. Tooth decay in kids is becoming more and more common these days, and most dentists see children as young as the age of two for dental treatments. This is an epidemic, and according to Parents.com, on average, one in four preschoolers has a cavity. The number grows to 55 percent by the time they are in kindergarten. Don’t be the person who schedules your dental appointments, and then constantly reschedules them. Simply because you may not enjoy the dentist, doesn’t mean your child can’t. In truth, it is much easier to simply go to one dental appointment for a cleaning and exam and maintain good oral health than it is to pay a lot of money for expensive, painful dental work later in life. It’s easy when you maintain a regular routine for dental visits, twice a year. By keeping your appointments consistently, you make it a normal activity, and so will they. Your child should have their first dental appointment within six months of their first tooth or their first birthday, whichever comes first. In general, your children will pick up what you practice. Eat a healthy diet, low in processed sugar that can damage your teeth, and your kids will follow. Sugar is the number one culprit when it comes to tooth decay, and it’s best to avoid sugary drinks and foods. This helps overall health, as well as creates a discussion to have with your children about cavities. It’s important that they understand that sugar sitting on your teeth creates decay, and we all want healthy and strong teeth to have a pretty smile and be able to eat the foods we love. 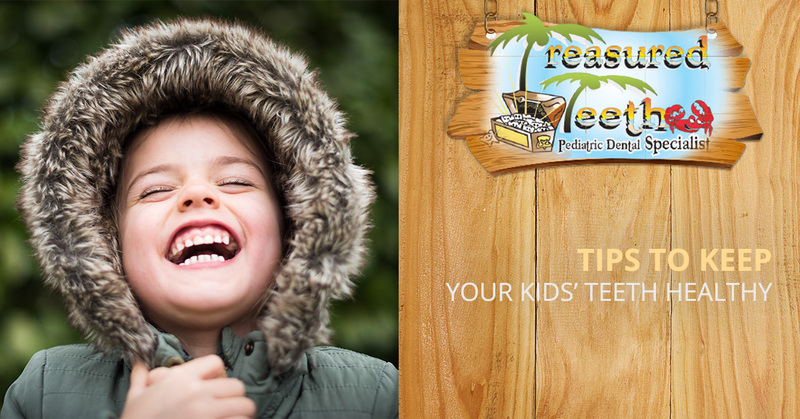 At Treasured Teeth, one visit to our dental clinic and you’ll be hooked (pirate pun intended). Between our pirate ship playhouse, friendly staff, and accommodating services including TVs in the exam rooms, the whole family will feel at home. When it comes to your child, we involve you in every step of our processes so that you know the status of your child’s oral health at each appointment. Call us today to schedule your appointment. © 2017 Treasured Teeth. Do Not Copy.